It primarily covers Photoshop CS6 and CC, although most if it can be applied to earlier versions such as CS5 and CS4. I'd imagine a large chink of it could technically be applied and translated to other software such as Paint Tool Sai. It details every little trick I've learned and implemented over the last dozen years of producing digital artwork by demonstrating a practical use on character art. Sai and Manga Studio fans will ask, "Why Photoshop? It's such expensive software compared to alternatives". Beginners might opt for cheaper software as their digital tool to start, and I wouldn't blame them. Something like Sai is great! I like it for inking and I've seen incredible results achieved with it. Although alternative software tends to have limits, and it's hard to argue a case against Photoshop's power and versatility. It's a tool students will eventually need to get to grips with once they go to Uni and Adobe programs are set up on their university or college computers. 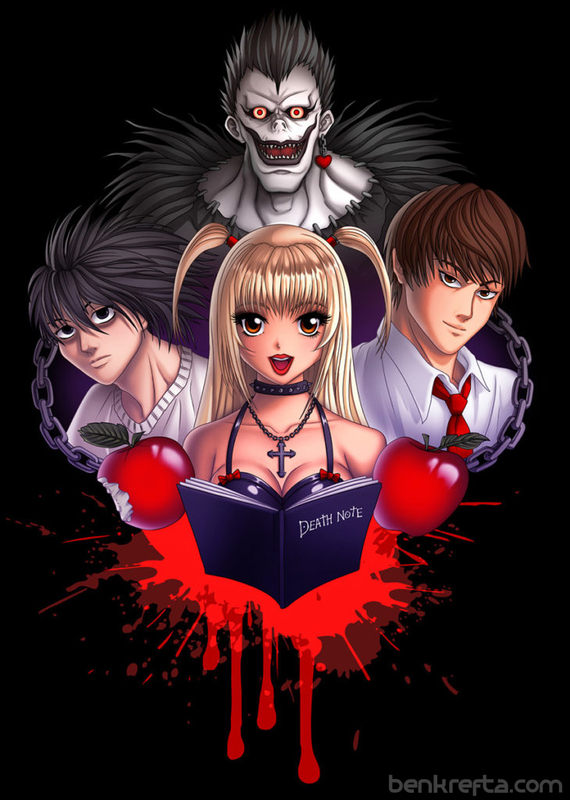 Most of the film, animation and game industry is still favoring PS for 2D art creation. If you want to be a professional and aren't taking advantage of PS's blending modes, Plug-ins and brushes, you could be doing your artwork a disservice or making things harder on yourself in the long run. Also, once you get to grips with PS, learning other software in the Adobe family becomes a little easier. Illustrator, InDesign or even Dreamweaver share a similar interface and are designed to be cross-compatible. Learning PS for my manga art allowed me to get employed as a web and graphic designer later down the line and a pure art or comic package might not allow that kind of transition. I have a lot of faith in the book... I know what I'm talking about and have been using Photoshop since Version 4 back in the late 90s and have experienced close to a dozen versions of the software. Check out my portfolio- the colour work is smooth, clean, detailed and expertly rendered and I'm teaching readers how to achieve a similar deep, vibrant and professional look to their artwork. The book covers the latest version of PS- books published several years ago may cover out of date software. I've tried to make Digital Manga backwards and forwards (as much as is possible) compatible. 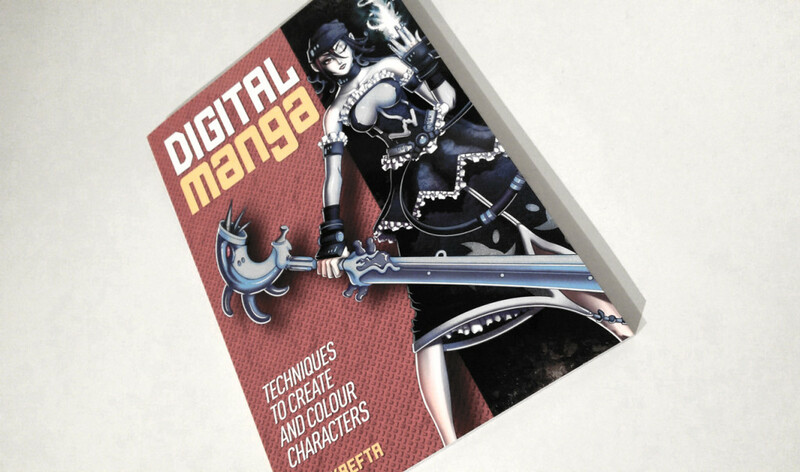 Digital Manga's tutorials covers a lot, and in-depth. The aim is to bring a novice up to a similar level to myself as quickly as possible. Art still takes a ton of time and practice to get better, but if I can bring a reader's colouring and rendering skills up a notch or two for a reasonable price, I'd like to think that's worth it. Online tutorials can be a bit hit and miss. I spent days researching what's already online and while there is some excellent stuff, it can be hard to find and there's also a lot of confusing, poorly written instruction. All these tutorials are scattered across the web in various locations while Digital Manga houses 160 pages of info in one place. - That info has consistency. It's written by the same author, so you know you wont be getting confused by trying to follow a different way of doing things from a different teacher. With digital, there are multiple ways to achieve the same result so I'd say be consistent and get the basics down before exploring other methods. Even if you read a lot of tutorials and have other art books, there's always room for another. I'd be very surprised if a reader didn't learn at least one new, useful technique from the book. I'm happy to offer assistance with any aspect covered in the book, so feel free to email me if you're having difficulty with something and I'll do my best to assist. And if you've read it, let me know what you think in the comments below. 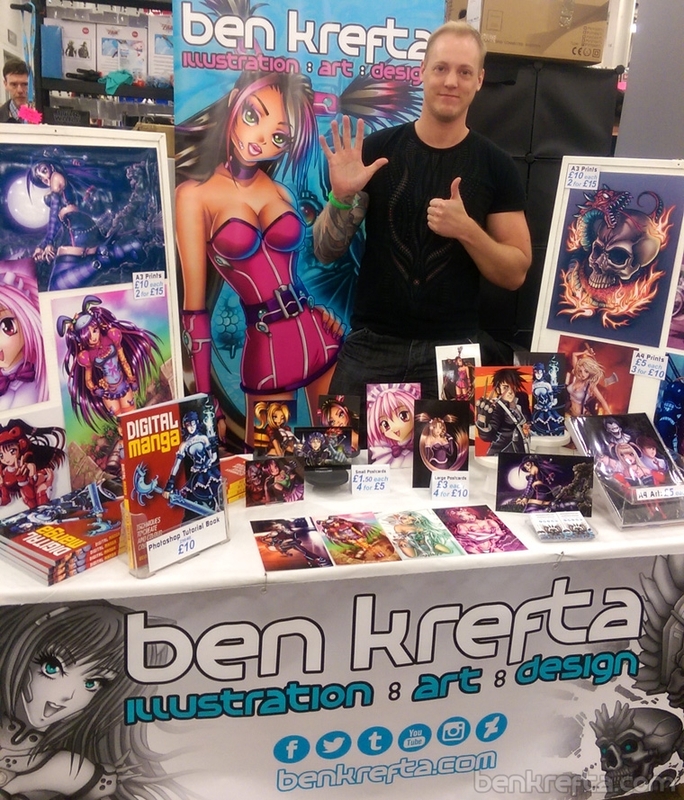 Another weekend, another convention! 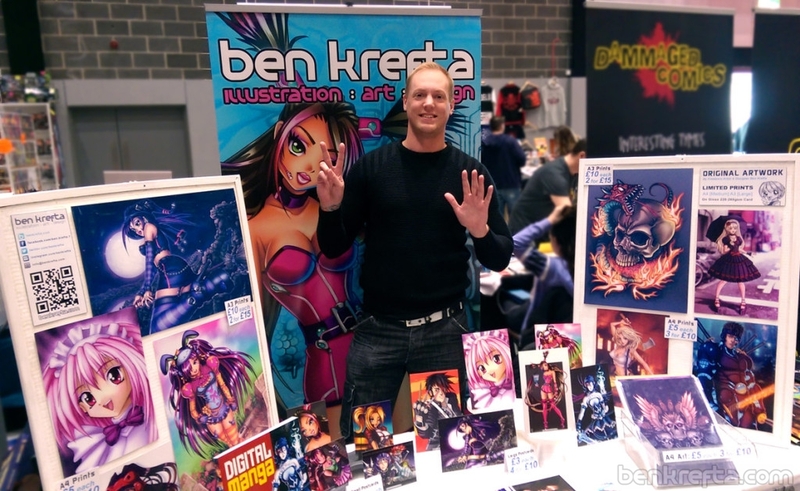 This time at the Film and Comic Con at Olympia in London. Now that the weekend has come to an end, I'm starting to run low on some of my stock. 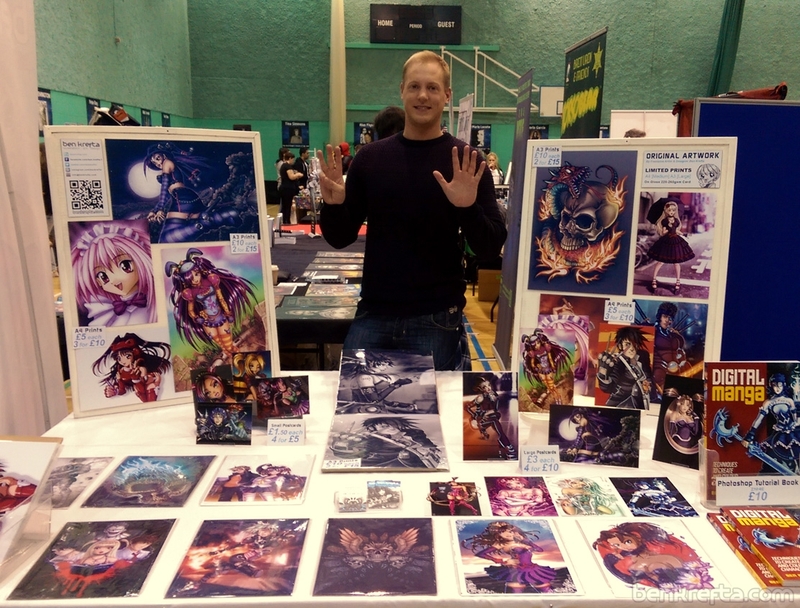 Only 2 or 3 prints left for certain designs and I'm down to my last 8 Digital Manga books which I hope will last for Liverpool's MCM con in a few weeks time. I'll be back at the LF&CC at Olympia in July this year.